Following a 29-month political vacuum, Michel Aoun was elected as the 13th president of Lebanon on 31 October 2016. The former army general was an ardent critic of Syria’s al-Assad family for more than two decades, but by the time he became president was a close ally of both the Syrian regime and its Lebanese Shiite ally, Hezbollah. Known as one of the fiercest opponents of the Syrian regime in the 1980s and 1990s, and highly critical of Hezbollah during his long years of exile in France, Aoun, who returned to Lebanon in 2005, has, in the last decade, become one of the most faithful allies of Hassan Nasrallah, the Hezbollah leader, and Syrian President Bashar al-Assad. This drastic change in the political position of one of the most popular Christian leaders in Lebanon has raised many questions about his motives. Some call it a reaction to a cynical alliance between anti-Syrian parties and Hezbollah during the Syrian troops’ withdrawal from Lebanon in 2005 following 29 years of occupation, which aimed, among things, to weaken his political power after his return from exile. Others attribute it to a long-lasting, opportunistic personal desire to become the head of state. Still others consider it a strategic move, the objective of which is to preserve Lebanese unity from a deep split between Sunnis and Shiites and to protect Christians from rising Islamism. To understand better this change in direction and other aspects of Aoun’s political stance, a deeper insight into his long military and political career is necessary. Aoun was born in 1935 to a poor Maronite Christian family in the mixed Shiite and Maronite suburb of Haret Hreik, Beirut. He has five siblings, two brothers and three sisters, and was educated at College Des Frères, a Marist Catholic school. After graduating in 1955, he enrolled in Lebanon’s Military Academy as a cadet. In 1958, he graduated as an artillery officer in the Lebanese Armed Forces (LAF) and then travelled to France where he received further military training at Le camp de Châlons. He graduated a year later and was promoted to second lieutenant. He also received military training at Fort Sill in the United States (1966) and at the École Supérieure de Guerre in France (1978-1980). On 30 November 1968, he married Nadia el-Chami and they had three daughters together: Mireille, Claudine and Chantal. After returning from France, Aoun rose quickly through the ranks of the Lebanese army, assuming crucial positions including head of the Defence Brigade (1980), commander of the 8th Brigade (1982) and brigadier-general (1984). In recognition of his efforts to preserve the unity of the army during the Lebanese civil war (1975-1990), Aoun was eventually promoted to commander-in-chief on 23 June 1984. He remained in that post until he was selected, on 22 September 1988, as prime minister of the six-member interim military government. The government initially comprised three Muslim and three Christian representatives. However, the Muslim members refused to serve due to pressure from the Syrian power-broker that fiercely opposed Aoun’s political presence. The decision by outgoing President Amine Gemayel (1982-1988) to appoint an interim government was due to parliament’s inability to elect a president. The Syrian authorities refused to recognize the new cabinet, instead backing the dismissed government headed by Selim al-Hoss. As a result, Lebanon was divided between a Syrian-backed government in west Beirut , later led by Elias Hrawi, and the three-minister interim military government headed by General Aoun, in the predominantly Christian east Beirut. Gemayel’s decision was of questionable validity, as it violated the unwritten National Pact of 1943, which reserved the position of prime minister for a Sunni Muslim. However, Gemayel argued that as the National Pact also reserved the presidency for a Maronite Christian, and as the prime minister assumes the powers and duties of the president in the event of a vacancy, it would be proper to fill that office temporarily with a Maronite. He also cited the historical precedent of 1952, when General Fouad Chehab, a Maronite, was appointed as prime minister of a transition government following the resignation of President Bechara el-Khoury. 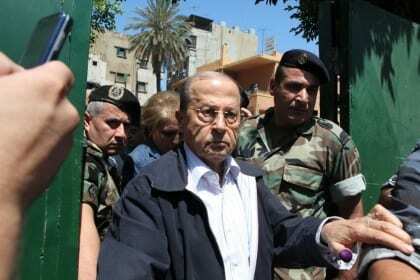 Aoun, who had the support of 60 per cent of Lebanon’s troops, turned against the Syrian occupying forces. On 14 March 1989, Syria bombed the presidential palace where Aoun lived and the Ministry of Defence, leaving 38 dead and 142 injured. Aoun declared a war of liberation on the 40,000-strong Syrian army. He officially ordered Syria to withdraw its troops and appealed to the international community for support. Aoun’s appeal was met with indifference by Western countries, with the exception of France, which supported him diplomatically and provided humanitarian assistance. He did, however, receive unconditional military assistance from the Iraqi leader Saddam Hussein. In the meantime, Syria increased military pressure with continued bombardment and the imposition of a naval blockade on the areas under Aoun’s authority. In October 1989, the Lebanese National Assembly (parliament) agreed on a Charter of National Reconciliation, also known as the Taef Accord (named after the city of Taef in Saudi Arabia, where the negotiations took place). Aoun had refused to attend, mainly in protest at the role Syria, Saudi Arabia and the United States had played in brokering the deal which put an end to the Lebanese civil war. He also denounced the politicians who attended as traitors and issued a decree dissolving the assembly and calling for elections under the supervision of the United Nations. After the Taef Accord was signed, he also denounced it for not specifying a date for the withdrawal of Syrian troops from Lebanon, hence violating its national sovereignty. Ultimately, the US government gave Syria a free hand in Lebanon in exchange for President Hafez al-Assad’s support for the eviction of the Iraqi army from Kuwait, which it had occupied in August 1990. With tensions between Aoun and the Syrian army intensifying, on 12 October 1990 Aoun survived an assassination attempt by a lone gunman while giving a public speech on the balcony of the presidential palace. The next day, Syrian forces attacked the palace. Aoun sought political asylum at the French embassy. Ten months later, French President Francois Mitterrand negotiated Aoun’s safe passage to France along with members of his government. There, with some friends, supporters and members of the Lebanese diaspora, Aoun initiated a resistance movement against the Syrian occupation. The movement officially became the Free Patriotic Movement (FPM) in February 1996. Banned in Lebanon, the scope of its activity was concentrated in Western capitals. In parallel with external lobbying, the FPM strengthened ties with local supporters and other opposition groups on the ground. Aoun explicitly accused the Syrian regime of being behind the assassination of Lebanese Prime Minister Rafic Hariri in February 2005. His supporters participated in the so-called Beirut Spring, a series of massive demonstrations that, along with international pressure on Damascus, led to Syria’s withdrawal from Lebanon on 26 April 2005. Aoun returned to Lebanon 11 days later to participate in the first free elections to take place in the country since the 1970s. Winning 21 parliamentary seats, Aoun’s FPM party exceeded expectations, proving to be the largest Christian bloc in Lebanon. Yet electoral alliances were not drawn along the lines of the 15-year political struggle. The FPM surprised many observers by entering into alliances with several former opponents, including some pro-Syrian politicians like Michel Murr and Suleiman Frangieh. This was seen as a tactical move in the complex Lebanese political game to the quadruple alliance forged between other revolutionary parties – the Future Movement, the Progressive Socialist Party and the Lebanese Forces, and pro-Syrian organizations, mainly Hezbollah and the Amal Movement. The new alliances between the FPM and pro-Syrian parties turned out to be more structural than short-term. In 2006, a memorandum of understanding was signed between the FPM and Hezbollah. The agreement regulated the relationship between the two parties and imposed the conditions of disarmament of Hezbollah and the release of Lebanese prisoners from Israeli jails. In addition, it elaborated a defence strategy to protect Lebanon from the Israeli threat and stressed the importance of normal diplomatic relations with Syria. Two years later, the FPM entered the government as part of the (pro-Syrian) 8 March alliance. In 2009, it participated, along with the same allies, in the parliamentary elections and the resulting government before toppling the Hariri cabinet in January 2011, through collective ministerial resignations. Aoun visited Syria in 2009 and met President Bashar al-Assad for the first time since the launch of the liberation war against his father, Hafez al-Assad, 20 years earlier. With the beginning of Arab revolts and the first signs of a popular uprising in Syria in 2011, the FPM at first adopted a noncommittal position. It officially supported the aspirations of Arab people for more freedom while avoiding criticism of the Syrian regime. Later, after peaceful protests against the al-Assad regime turned violent, some internal voices criticized Hezbollah’s direct and growing involvement in the neighbouring conflict. Yet as the weeks and months passed and Sunni Islamist groups gained prominence throughout the region, especially in Iraq and Syria, the FPM adopted a position clearly in favour of al-Assad and Hezbollah’s narrative, which justifies the conflict, as their war against takfiri terrorists. On 31 May 2014, Lebanese President Michel Suleiman’s term ended, leaving the country without a leader and most of the state’s institutions merely functioning for 29 months. Aoun has always been vocal about his ambitions to run for the presidency, but for 44 electoral sessions, the FPM and Hezbollah MPs boycotted the sessions because they did not have the necessary votes for Aoun to win. However, in a historic turn of events and after the endorsement of his decade-long rivals in the 14 March alliance, army commander Samir Geagea and Future Movement leader Saad Hariri, Aoun was elected president on 31 October at the 46th electoral session of the Lebanese parliament. Now dubbed ‘the father of all’, Aoun is attempting to serve his term as a president who is at an equal distance from all.